Death Valley is alien. It's strata resembles Mars more than Earth. You can sense it wasn't intended for human habitation. Rem-rod and I camped out Easter night on the valley floor waiting to hear the infamous packs of coyotes sing. Effectively the first time I've ever slept below sea-level. The coyotes let us down but the scenery did not. The colorful rock formations on several canyon hikes were astounding. 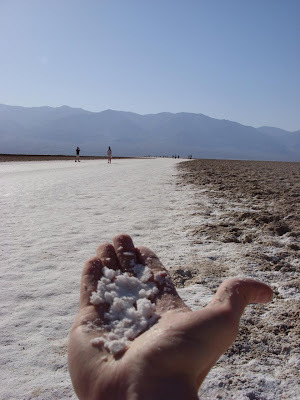 I visited Bad Water Basin (interesting story behind the name), at negative 282', and sampled the salt flat covering the valley floor. Ubehebe crater is impressive, as are the mineral rich hills stained shades greed and red. 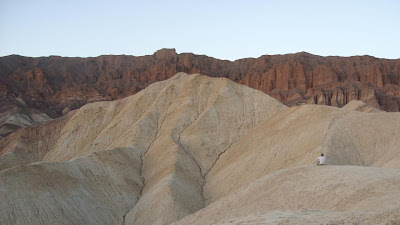 Death valley has an evocative history that you can almost see in the daylight. From certain parts of the park you can simultaneously observe Mt Whitney (14,505' the highest point in the lower 48) and Bad Water Basin (the lowest terrestrial point in the Western Hemisphere). DV is no doubt a collection of rare earth but way too spicy for me, I felt like I was in a microwave while the sun was up. I'm VERY glad I went, but I won't be going back soon.